A plant to stop you in your tracks! Brilliant crimson flowers sit above dark green foliage. Perfect with dark blue lobelia Crystal Palace. Stunning! Height 20-25cm (8-10"). HA - Hardy annual. Easy to grow plants that will provide a blaze of colour in borders, tubs and baskets. The perfect way to clothe a dry, sunny border. Compact variety. Note: Flowers and leaves are edible and give a peppery flavour to salads. Sow March-June to flower June-September. Suggested planting distance 15cm (6"). Ideal for beds and borders, patio pots and containers. RHS Perfect for Pollinators. Drought tolerant. Prefers full sun. 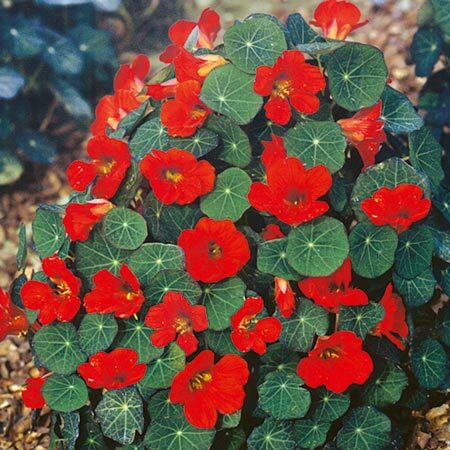 Will create a blaze of colour in poor soils and hot, dry spots.